Littlemissperfect is out of a Phipps-bred dam tracing back to Lady Be Good, which means she is from the female family of Squander, Discipline, Goodbye Halo, Burning Roma, Val’s Prince, Mining, Wavering Monarch and Finest City, as well as 2017 Grade 1 winner Off Limits[IRE] and 2017 Group 1 winner in Australia Invader. Littlemissperfect is out of Admirer, a 3/4-sister to Grade 3 winner Party Manners, a full-sister to the dam of Grade 3 winner Proceed Bee, and a half-sister to Grade 1-winning steeplechaser Sovereign Duty. Littlemissperfect’s second dam is multiple Graded Stakes winner Duty Dance, and her third dam, Discipline, won the Demoiselle, the Test and the Molly Pitcher. We claimed Littlemissperfect in December 2016, and she scored a victory for us (our first as an owner) and trainer Mike Trombetta on June 10, 2017, at Laurel Park going 7 furlongs on dirt. 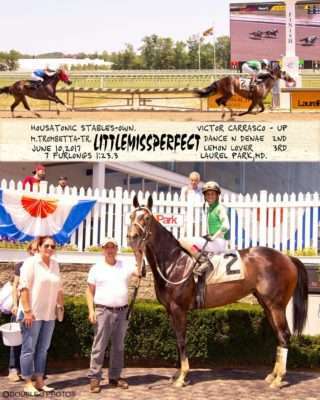 That was the eleventh win of Littlemissperfect’s career. 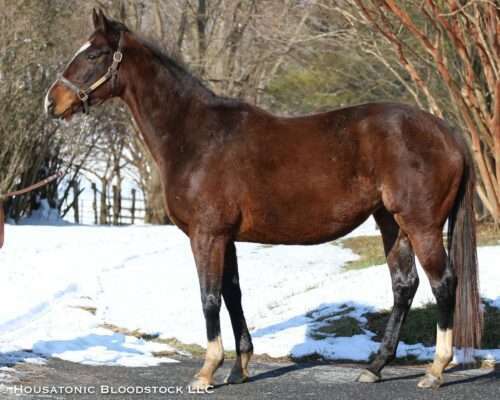 She was subsequently claimed away from us in July 2017, and we claimed her back again in November as a broodmare prospect. Littlemissperfect retired with a final record of (47) 11-7-6, $258,346, having won on dirt and turf, from 7 furlongs to a mile-and-a-sixteenth, at eight different tracks, including Belmont, Aqueduct, Churchill Downs and Laurel. Littlemissperfect will deliver her first foal in 2019 — you can read here why we picked Imagining for her. We had initially planned to breed her back to Mor Spirit in another Housatonic Recommended Mating, but given that her expected foaling date is relatively late, we are considering local options for her again this spring instead. You can check out Littlemissperfect’s race record and charts here, and see more photos of her here.